My son has loved the game of baseball since he was a little boy. I remember him at 18 months, with his rubber bat and ball in hand, watching the Brewers play on TV. As a two-year old he refused to hit the ball off the tee so we pitched to him and he hit those wiffle balls over our heads. He is now a senior in high school and over the years he has taught me many things about his favorite game. I understand the term balk and things like fielder’s choice and ground rule double. I have a concept of the infield fly rule – just please don’t ask me to explain that one. 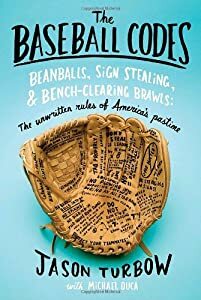 When I was looking through our new collection of Playaways for something good to listen to while I walk, I came across The Baseball Codes: Beanballs, Sign Stealing & Bench-Clearing Brawls: The Unwritten Rules of America’s Pastime by Jason Turbow. I thought here is something to help me understand the game even more but what did the author mean by unwritten rules? As I started to listen, the answer to that question became clear. This book is not about anything you will find in a rule book. It is about the unwritten code among major league players. Do pitchers at this level really throw to hit another player? When is it acceptable to steal bases? Is it acceptable to watch your home run ball leave the park? How much of a lead is enough of a lead before you stop stealing and start subbing players? Here are the most important questions, what happens when the other team is not playing by the same codes? And, what happens if you haven’t learned all of the codes? I actually had to check this book out a second time so that I could finish listening to it. When I left it on the kitchen counter, my son saw it and asked if he could listen too. That was the last I saw of it until it was due at the library. He really enjoyed this book and it was great to be able to talk about it with him. The library is great for many reasons. Now I can add another one to the list – ways for moms and their 18-year-old sons to connect and enjoy the same book!